“I’ve got insider news”. “Someone I know works inside”. “This place is gonna en-bloced in 6 years time”. These words were uttered smugly by a bespectacled man with a cigarette in his hand. I had to walk away upon hearing these words as the resentment welling up within me was too intense to handle. Maybe I’m just too obsessed with this estate. Perhaps this frustration stemmed from the seemingly indifferent attitude I witness and felt amongst some Tiong Bahru residents. Maybe no one really cares if this place would be en-bloced or conserved. What seems to matters most would be how much the en-bloced compensation would be and would the allocated flats be near a MRT station. Seriously, you do not need HDB to en-bloced your home to get a windfall! There are many other ways to make money. My family has never benefitted from whatsoever handouts HDB has given out. When I purchased my 1st flat*, it was a total disaster for my wife and me. We bought our flat impulsively at $495,000 and plonked in another $80,000 to renovate and furnished it. HDB gave us a $40,000 CPF grant but that did more harm than help. We later sold the flat off at $425,000. Our losses come up to about $125,000 (inclusive of accrued CPF interest). To me, that was a financial disaster. My wife and I never whine about that. We took it in our stride and recovered from it. We stayed focused in our plans to become financially educated. I also put in effort to improve my knowledge in real estate so that I can be a better investor and at the same time provide better advice to my clients. We are still learning as learning is a journey with no destination. We kept reading relevant books and tried to put what we have read into action. I am also fortunate enough to meet many people along the way who could offer good advice and directions. We have developed some kind of AWARENESS and this is a good start. I strongly agree with Robert Kiyosaki that all of us should stop having this ENTITLEMENT mentality and instead steer our own future. As the saying goes, give a man a fish you feed him for a day, teach him to fish and you feed him for life. I was sold a fish when I bought my 1st HDB flat. I am now learning how to fish. So for whatever reasons you might have about buying into Tiong Bahru and one of them happens to be about some en-bloc windfall, I urge you to explore other options which has a more certain outcome. Betting on some insider news is akin to gambling. One of my wise clients recently said this to me: “Wiseman PLANs, Poor man HOPEs”. There is much wisdom in that statement. But if you already living here in the Tiong Bahru Estate and you cannot really tolerate living in these walk-ups anymore, give me a call and I will help you explore possibilities on how you can be happily moved to a place where there are ELEVATORS and extra toilets to serve you. That way, we can still keep Tiong Bahru low density. Being collectively INDIFFERENT to the fate of this estate would be the greatest tragedy. If everyone is consumed by that song, the GREED will eventually come and Tiong Bahru’s low density existence will be threatened. *Note: I was not yet a real estate agent when I purchased my 1st HDB property. ** When real estate agents cajole you into buying a property, do not become too emotional and overstretch your budget. Remember, you are the one who is going to service that mortgage loan over a long period of time and that agent would not be around to help you service that loan after the sale. You need to know your own financial numbers so that no one can pull wool over your eyes. *** Stumbled upon this site and I would like you to check it out too: http://www.saveclementipark.com/. I am glad there are some people at Clementi Park who cared enough to speak out. Unwanted child of S’pore conservation? For too long, the once-lovely Capitol Theatre has stood forlorn and forgotten, the unwanted child of Singapore conservation. Newspaper reports once held out hope of it being transformed into a performing arts centre for musicals, plays and ballets. That, alas, was in January 1996. Even then, the report quoted government officials as saying that the plans were ‘still being studied’. Never mind that the site had been earmarked for development in 1984, and acquired by the state in 1987, nearly a decade earlier. More delays followed. 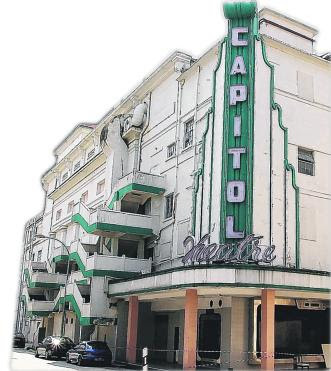 In 1998, Capitol screened its last movie and the cinema was shut down amid much sadness and hopeful talk of plans to put it to better use. The project was handed over to the Singapore Tourism Board to pursue in 2000. But in 2006, it decided not to proceed and handed it back to the Singapore Land Authority. Last year, it was finally declared a conservation area. Sadly, over the years, nobody seemed either to own the project or to care all that much about it. So, pardon me, but I could not help being more than a little sceptical when I read a report earlier this month which talked of fresh plans for the Capitol Theatre and the structures around it – Capitol Building, Capitol Centre and Stamford House. The report raised as many questions as it answered: Just what do the authorities now envisage for the site, which they say will be sold as an ‘integrated one’ next year? So far, officials have said only that the area has not been ‘fully maximised to its development potential’ – indeed! – and the ‘timing and details’ of their plans ‘are being finalised’. Why has it taken decades for any progress to be made on conserving this area? What is the cost of leaving Capitol idle all these years, allowing it to crumble away to a dusty death? And just who will ensure that the plans are realised this time? These are legitimate questions, not least since the buildings concerned are very much part of Singapore’s architectural heritage. Capitol Theatre turns 80 next year. The neo-classical style building was built in 1929 by M.A. Namazie, an early Singapore pioneer of Persian origin. The accompanying four-storey building, where the popular Magnolia Snack Bar once stood, was completed in 1933 and called the Namazie Mansions back then. The cinema was Singapore’s very first, where the likes of Charlie Chaplin and Douglas Fairbanks performed to promote their silent movies. In the 1960s, the Capitol hosted variety shows featuring performers like Sakura Teng and Rita Chao. The adjacent Stamford House has an even longer history. It was designed for commercial use in 1904 by R.A.J. Bidwell, the man behind other outstanding buildings such as the Raffles Hotel and Goodwood Park Hotel. Few seem to recall the furious debate that broke out in 1991 over whether Stamford House should be saved instead of Eu Court, built in the 1930s, across the street. Then National Development minister S. Dhanabalan declared that Stamford House would be preserved as it had a ‘more outstanding architectural style’. I was prepared then to give the minister the benefit of the doubt, and wait to see if the ramshackle Stamford House of those days would indeed be transformed into the conservation gem he envisioned. So, when the Victorian facade of the building was unveiled three years and $13 million later, I had to concede that it did look splendid, as the minister had said. But sadly, it never quite lived up to his promise of becoming ‘an active and successful commercial centre’, given its motley collection of furniture shops, galleries and eateries, several of which came and went. The wider issue here is this: Just how does Singapore go about conserving its architectural heritage, saving grand old buildings and giving new life to them? Of course, given the space constraints on this tiny island, I have never believed in keeping buildings as museum pieces, or standing in the way of development. But, in these days of globalisation and rapid change, a sense of place and continuity is needed if Singaporeans are to remain rooted to this country. Indeed, at the moment, Singapore is undergoing another spurt of redevelopment. Just as in the 1980s and 1990s, when familiar sites like the modest C.K. Tang store or the huge open field where Ngee Ann City now stands gave way to skyscrapers, the Ion Orchard and Orchard Central are rising rapidly from the ground in Orchard Road. These, and the redevelopment of the Asia Hotel site in Scotts Road, as well as the new St Regis Hotel in Tanglin Road are transforming the face of the downtown area as we know it. So how to ensure continuity in the face of such change? Well, to be fair, there have been quite a few success stories in conservation over the years, such as the Fullerton Hotel, Raffles Hotel, the National Museum, the old Parliament House, and the old St Joseph’s Institution building. In these cases, the buildings’ structures were painstakingly conserved, even as their interiors were retrofitted to allow for new uses, commercial or otherwise. Sure, the purists moaned, but the conservation purpose was served. There have been some bad misses too. Orchard cinema and the National Library were both razed to the ground despite fervent public protests. Or ponder this: Just what is the difference between the ghastly named Orchard Cineleisure and the supposedly conserved Cathay building? Precious little, actually. The former was built after tearing the old cinema down completely, while the latter was simply erected around a sliver of the facade of what was Singapore’s first skyscraper, as a sop to the conservationist lobby. Clearly, there are lessons to be learnt from these hits and misses over the decades to help ensure that the re-development of the Capitol area turns out right. Spell out their Capitol conservation plans in much greater detail. While they are at it, they should consider redeveloping the SMRT HQ building across the street. Why a public transport operator needs such a large prime site, all walled up and uninviting, has always been a mystery to me. There is much potential to liven up the entire area on both sides of Stamford Road, with an array of streetwalk dining, retail and entertainment options. Engage the public, both to get ideas and foster a sense of ownership of this historic district. Surely, Singaporeans should not wait until plans are announced to demolish an old building before taking an interest? Nor should they be left to bemoan conservation efforts gone awry after the fact. Announce a timeline to make clear how and when the authorities will ensure that the area’s ‘development potential is fully maximised’, at long last. It would be a pity if Singaporeans have to wait another decade to read the next report on new plans ‘being studied’ for Capitol. I was having a chat with this guy from China yesterday. Even though I was having trouble understanding his heavily accent Mandarin, I understood he was complaining about why this owner would not just replace the windows. 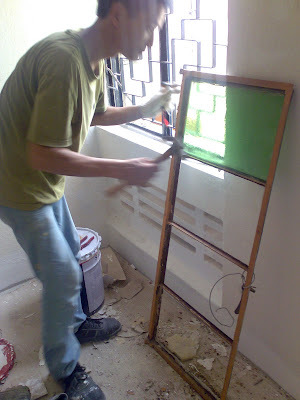 He kept saying the windows are old and it is dangerous to keep them as they risk falling off. He kept mumbling that it would be better to just change all of them. Maybe he was trying to frighten the owners into changing the windows so that he need not spend so much time “processing” the windows. From what he described to me, it does indeed sounded very time consuming. But then again, restoration work is never a breeze right? 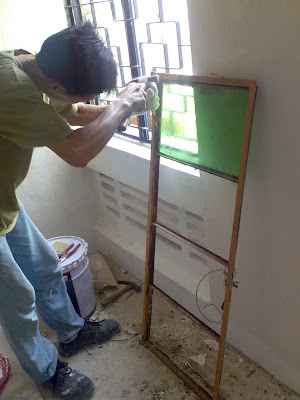 At the same time, he cannot damage the green window panes as I think these are irreplaceable. His boss has been scouting around for the glass but he just cannot find them. 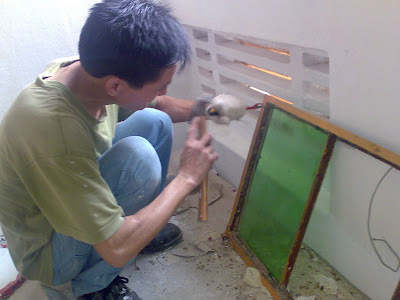 After he takes out all the glass, he has to sandpaper the entire frame before rust-proofing it. Some of the window hinges are already quite badly damaged. This guy has to weld the hinges back. I’m glad this home owner took the pain to restore the windows and not take the easy way out by replacing them. Could this happen to Tiong Bahru? HONG KONG – AN AMBITIOUS plan to convert one of the few remaining colonial buildings in skyscraper-dominated Hong Kong has rekindled a fierce debate about how the former colony deals with its heritage. In the past year, fierce protests over the removal of the city’s Star Ferry terminal and the destruction of Queen’s Pier, where Britain’s royalty used to step onto the territory, has altered the city’s laissez-faire attitude to development, activists say. Now, a HK$1.8 billion (S$318 million) plan to convert the old police station, jail and magistrates court into a gleaming commercial, arts and public space has become a testing ground for the city’s ability to reconcile historical and profit concerns. The scheme, with a distinctive set of giant spikes in a prime residential and commercial area, has divided opinion. ‘The proposal of building a 50-storey glass tower inside the complex is unbelievable. And to me, it definitely will dominate the whole heritage site and actually won’t do any good to it,’ said Ms Katty Law, an activist. Mr William Yiu, executive director of charities at the Hong Kong Jockey Club, whose gambling monolopoly has allowed it to become both the city’s biggest taxpayer and philanthropic giver, said their scheme is an attempt to do something new. ‘We want this to set an example of conservation,’ said Mr Yiu, who is running the scheme that sits on one of the few remains of the British colonial era to survive in the city’s Central district dominated by gleaming office blocks. The site was chosen by the British navy as the centre for law and order when it took over the island, then little more than an obscure rock, in 1841, and it flourished as the city expanded. New design The new design – by Swiss architects Herzog and de Meuron, who are behind the Birds Nest Olympic stadium in Beijing and the conversion of the Tate Modern in London – will put galleries, boutiques and restaurants within the shells of the existing listed buildings. It will then create a new structure behind the buildings that will include a theatre, a cinema and two elevated public gardens, bordered by the collection of spikes which will have plants growing around them. The spikes, inspired by the distinctive pattern of the bamboo scaffolding seen across the city, have drawn ire from residents nearby and also concern that it will upset the city’s feng shui, or energy system, which is rumoured to have been a factor in several other major building designs in Hong Kong. Mr Yiu said he is not expecting a repeat of the protests at Queen’s Pier last summer, when conservationists tied themselves to the structure to try and stop its removal, as the buildings will be left in place. He said the Jockey Club has been involved in a lengthy public consultation, despite being given pre-approval by Chief Executive Donald Tsang in his annual policy speech last year and that parts of the design, including the spikes, were being reconsidered as a result. Public pressure Campaigners say that public pressure in recent years has transformed the government’s attitude to conservation, where commercial considerations have steamrollered any concerns in the past. ‘I think the government is now realising that there are opportunities and that it is nice to have some diversity,’ said Mr Paul Zimmerman, founding member of pressure group Designing Hong Kong. Mr John Batten, whose campaigns have enjoyed success in stopping several developments – including on the site of the former residential quarters for married police officers where Mr Tsang grew up – said the change in attitude among authorities has been marked. ‘Government has changed dramatically. They are now pointing the finger at the property developers. Before they would not have looked for the faults,’ he said. Mr Batten said the change has come about because of a series of strong targeted campaigns, ranging from the Queen’s Pier demonstration to efforts to stop the destruction of traditional wet markets. ‘I think these cases come down to a very grassroots approach. It is built on community support for the ideas,’ he said. However Mr Batten is frustrated at the way the new Jockey Club scheme was presented as a fait accompli before consultation. This rustic laid back image has been erased forever. For the whole of last week, I was wondering why there were so much hacking and drilling activities and I thought a new neighbour was renovating their place. 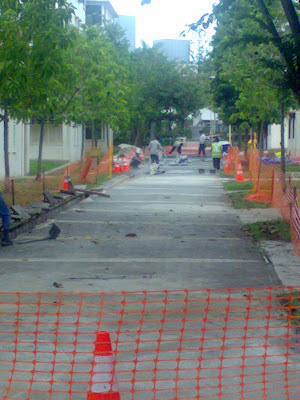 It was only when I was walking to the Tiong Bahru Market that I spotted some workers along this pavement. I thought they were repairing the drains or just doing some resurfacing of the walkways as there were some cracks along the pavement. Perhaps someone complained about those cracks as it made roller blading a little bit more challenging. 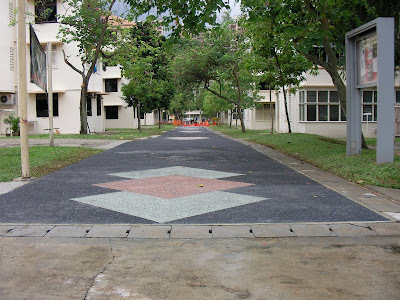 Anyway, I walked off thinking that it was just some routine maintenance undertaken by the Tanjong Pagar Town Council who responded to some of the resident’s frivolous request. Saw this yesterday while on the way to Eng Watt Street. So not only did the town council made this pavement a better place to roller blade, they made it a nicer place to roller blade as well! I hope this “enhancement” will quell all talks about this place being en-bloc in the near future. By the way, I do not know how to roller blade and I am hoping to learn it someday. Yes, someday. Here’s an opportunity not to be missed! Heritage Guide, Geraldine, will be conducting a tour this weekend (24th Feb 2008) from 9:30am to approximately 12:30pm. If you are keen, please give Geraldine a call at +(65)6737-5250 or +(65) 8155-1390. Heritage Guide Geraldine will start the tour with a short talk of the history of the area and Cheong Hong Lim, the donor of the most amazing Geok Hong Tian Temple 1887. The group would be able to witness devotees celebrating the birthday of the Jade Emperor & the Monkey God which happens around the ” Chap Go Mei” – first full moon after Chinese New Year. The walk will bring the group past some interesting trees and also the grave of a well-known philanthropist, Mr Tan Tock Seng, founder of 4 hospitals in Singapore! The group will stop to have refreshments near the famous Singing Bird corner that was once a Tiong Bahru Landmark. The bird corner is closed temporarily but we all hope it would be back in a jiffy! Along the way, the group will also check out the best local cake shop and the new Tiong Bahru Market whilst walking through some of the 1930’s Art Deco block of flats. The tour will end with a visit to Eng Hoon Street to observe the Monkey God’s birthday celebrations and to hear about the rituals & customs that are practiced there. After which the group can have lunch at the numerous eating places nearby. If you are interested to join this tour, pick up the phone and call or SMS Geraldine now. Don’t procrastinate. Many thanks to Kelvin Ang and Melvyn Wong for forwarding the email for this event to me. Let us take a few moments to mourn the loss of this rare authentic PRE-WAR windows. These windows were installed during the 1930’s when the British built the Tiong Bahru Estate (Singapore’s 1st Housing Estate). It not only survived the World War II bombings, it also witnessed the birth of our young nation. 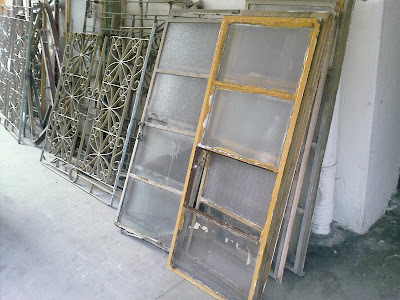 Despite being a little rusted at some parts of the frame…… due to years of neglect, these windows were still faithfully serving the occupants of the flat……until the flat was sold to someone. “Too old and outdated!” the new owners must have thought. “Fifty Dollars, that’s all they are worth”, said the window installer to me as I was snapping this picture. Not wanting to give the window installer an opportunity to think that I’m a mental case, I walked off. But my heart was a little heavy. Isn’t these Tiong Bahru flats conserved in December 2003? What was really being conserved? Can we truly find a MINT CONDITION 1936 flat within this estate? I have not seen any so far. 90% of buyers who bought into the Tiong Bahru Estate recently did not buy it because of her historical value. Some do not even know why this place was conserved in the first place! Some bought it to “FLIP” and make some quick bucks while some bought it to rent it out…….nevermind how many or who will eventually live in it as long as it makes economic sense. I am beginning to wonder if Tiong Bahru Estate was conserved “wrongly”. After December 2003, there was NO MORE follow up activities. No one seems to be policing anything at all. Due to a lack of guidelines, this area seems like a free for all situation and many home owners are constantly testing and pushing the limits. Perhaps it is because this area is the baby of two statutory board that it became no one’s child. By the time HDB and URA decide who will take total responsibility for this estate, I think not many of these types of PRE-WAR windows will be around by then. You are currently browsing the archives for the Conservation category.